It is the time of year when TCM celebrates 31 Days of Oscar. I think this year's kicker of showing titles in alphabetical order is both clever and cute. Those of us with a fondness for Comedy, sub-genre: Screwball will find a treat brought to us under the letter "M". 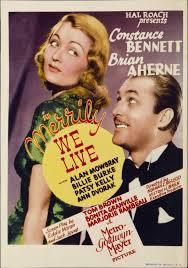 1938s Merrily We Live's pedigree for inclusion in the lineup is a whopping 5 "count 'em" 5 Oscar nominations. They are listed here along with the winners in each category. PS: I would have found room on those acting lists to include Alan Mowbray and Clarence Kolb. Noted Washington, DC newspaper correspondent J. Chauncey Cory and his wife Edith Rathbone Brainerd collaborated as authors under the name E.J. Rath. Their comic novel The Dark Chapter was first adapted as a play by Courtenay Savage called They All Want Something that had a brief run on Broadway in 1926. Screenwriters Eddie Moran and Jack Jevne gave us this feature along with Topper, Wonder Man, Topper Takes a Trip, Wintertime and There Goes My Heart. Other versions of the story are 1930s What a Man and 1955s Escuela de vagabundos aka School for Tramps. 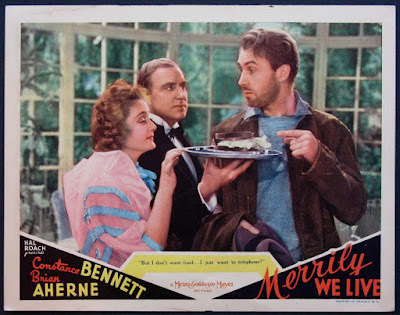 Surprisingly, or not considering the Academy, Merrily We Live's director Norman Z. McLeod was never nominated for the award despite his many classic comedies including Monkey Business, Horse Feathers, It's a Gift, Topper, The Secret Life of Walter Mitty and Road to Rio. Like Bill Wellman, Norman McLeod was a veteran aviator of WWI. An artistic bent led him to begin his picture career as an animator. Who are these people who live so merrily? The Kilbourne household is wealthy, sub-genre: eccentric. All and sundry are at the passive-aggressive bidding of the scatterbrained mistress of the household played by Billie Burke (Dinner at Eight). Mrs. Kilbourne's privilege takes a charitable turn in that she feels blessings must be shared. Her particular charitable cause is that of tramps. She takes tramps into her home to reform them. Invariably these tramps make off with the family silver leaving her disappointed, but undaunted. Who suffers most from these actions? It is Grosvenor, the butler played by Alan Mowbray (Terror by Night). He suffers at the hands of the family, at the disrespect of his underlings and mostly from the very presence of the tramps. Grosvenor will leave one of these days, mark his words. His bag is always packed. Clarence Kolb (His Girl Friday) plays Mr. Kilbourne, the supporter of the nonsense under his roof. I never knew a man could put up with so much nonsense and take so many pratfalls! 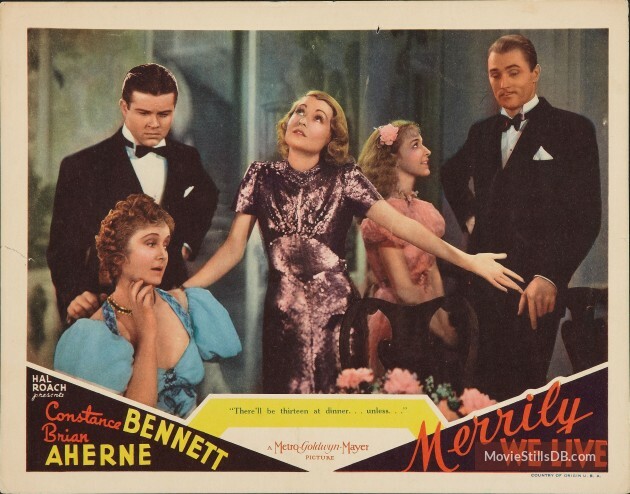 Bonita Granville (These Three) is young daughter Marian, a smart aleck of the first order. Tom Brown (In Old Chicago) is the lone son and feels every inch the outcast. Oldest sister Geraldine is played by Constance Bennett (Topper) and she deftly plays both the roles of peacekeeper and instigator in a family that thrives on patter and gags. Fashion note: Constance Bennett looks divine in both her casual and formal wear designed by Irene. Howard Greer designed the costumes for Billie Burke and she never looked more divine. Into this garden spot comes Rawlins played by Brian Aherne (The Great Garrick). Wade Rawlins is an author on vacation. An author on vacation who doesn't shave, dresses shabbily and runs into car trouble. All he wants is to use the Kilbourne's phone, but Mrs. Kilbourne immediately and confusingly takes him under her wing as another tramp who needs saving. Rawlins puts up with it because he is amused by the lady of the house and he is intrigued by Geraldine. Once shaved, Rawlins become the object of affection for Geraldine, Marian and the household staff of Etta played by Patsy Kelly (Rosemary's Baby) and Rosa played by Marjorie Kane (The Dentist). You can well imagine the sorts of mix-ups and hijinks that occur under these circumstances. When Ann Dvorak (Scarface) as a senator's daughter, mistakes Rawlins for another guest at an important dinner party and not the help, everybody's life gets turned upside down. Merrily We Live is a grand tangle of sight and physical gags, along with deliciously goofy and barbed dialogue delivered with aplomb by an expert cast. I promise you laughs and the movie will deliver. 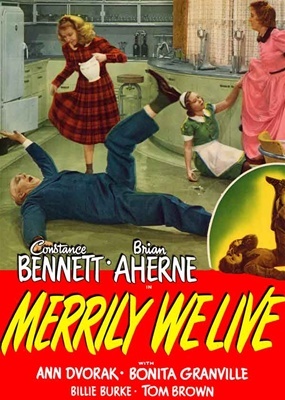 TCM has Merrily We Live scheduled for Thursday, February 16th at 5:00 a.m. on the TCM programming day. Possibly in your thinking it is early on February 17th. Some of us do think like Billie Burke from time to time. PS: There are Pat Flaherty, Olin Howland and Willie Best sightings for those into such things. This sounds like so much fun!! Love Burke. Thank you for sharing. My pleasure. Do try to catch it this month. I'll be very surprised if it doesn't tickle your fancy. A very entertaining movie! You know, Billie Burke practically had a patent on playing eccentric characters (well, except for Glinda). I just watched TERROR BY NIGHT again with Alan Mowbray in a key role (no spoilers!). I've been on a Sherlock movie kick lately. Each one has something to enjoy. Terror by Night? Trains, Skelton Knaggs and Alan Mowbray - what's not to love. It was my daughter's favourite when she was a kid. I love Mowbray's dry comic style in Merrily We Live. A hidden jewel which I was introduced to a few years ago in connection with a poll of 1938 movies. Mr. Kolb's turn on the staircase deserves the same classic status as Mr. Cagney's little jig down the White House steps. Uncle Waldemar! How have you been? Was thinking about you the other day. True. Kolb really impressed me in Merrily We Live. It is a movie filled with delights. What a great cast. Hope I can catch this. How do we manage to get through life seeing so many oldies that we think we must have seen them all -- but are constantly discovering we ain't seen nothing yet? I'm always shocked, but still pleased, to discover a new "oldie". That this one escaped me for so long is baffling. All those Oscar nominations alone should have slated it for scheduling on all those channels we had growing up. Onward, movie archaeologists! Me too! Since they won't be changing any time soon, we'll have to switch to the TCM day. I hope you don't miss this one. It's a dandy!